What happened to Atif Shafiq, at the end of his last fight, wasn’t in the script. The scene seemed set for the unbeaten 21-year-old’s to win his first professional belt, the British Masters Bronze lightweight title. A Cameroonian, eight years his elder, Abdon Cesar, put a blemish on Shafiq’s previously perfect record of 13 wins. 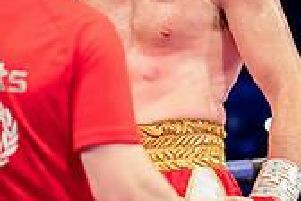 The Stockton on Tees based boxer claimed an eight rounds win on points at iceSheffield. That was November last year. The show is headlined by Doncaster’s Jason Cunningham, who takes on Tanzanian Nasibu Ramadhani, for the Commonwealth bantamweight title. Sahfiq, an Ingle boxer who has trained at Ricky Hatton’s gym, has a good fan following, and they will be anxious to see him force a repeat of his two stoppages, previous to the Cesar fight. Also on the show is another Rotherham boxer, heavyweight Kash Ali, 23, who has an eight fight winning record and has stopped his last two opponents. He too is getting in the ring for the first time this year.